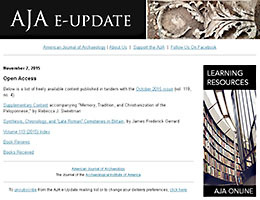 The AJA e-Update is an electronic-only monthly newsletter that provides advertisers an effective means to connect with a loyal and responsive audience. It is circulated to 13,000 opt-in recipients. * Frequency discounts and AIA e-update package discounts available. Two weeks prior to ad placement. Size and resolution: max. 250 KB, 72 ppi. Advertisers and advertising agencies are bound by rates outlined in the current AJA Advertising Rate Card (PDF) and above. Final copy must arrive via email no later than two weeks prior to online placement. Failure to provide copy by the deadline will result in reservation cancellation. In such cases, the AIA reserves the right to assess a cancellation fee. Advertisers contracting for multiple e-Updates or an AIA e-Update package must do so in advance. The discount will not be applied retroactively. Payment in full is due 30 days from invoice date. All payment must be in U.S. dollars drawn on a U.S. bank. The AIA reserves the right to unilaterally reject, omit, or cancel advertising that it feels is not in keeping with AIA vendor policy. All advertising must be for products or services that support research, publishing, or teaching activities of persons engaged in the study of archaeology. Advertising for the sale of antiquities is strictly prohibited.